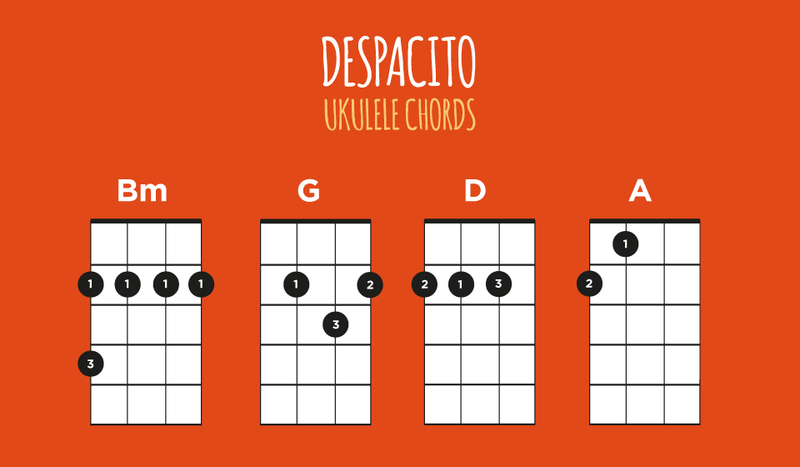 This is a pretty good song for beginners as it only has four chords in it. 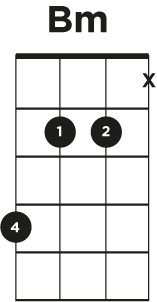 One of those chords is a barre chord though – head this way if you need help with barre chords. There’s a lot of repetition here, you’re basically playing the same chords in the same order with the same strumming pattern throughout. In this version we don’t fret or play the G string. 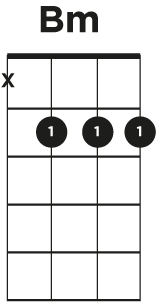 This means that you can get away with just barring at fret 2 and strumming the bottom 3 strings. It’s still a B minor. It does still have a bit of a barre in it though. For this alternate version of B minor, we don’t fret or play the bottom string. This means shuffling your fingers around a bit. I play the C string with my index finger, the E string with my second finger and I use my pinkie to hit the 4th fret of the G string (top string). Both of these alternatives are legitimate B minor chords, so don’t feel like you’re cheating if you use either of them. 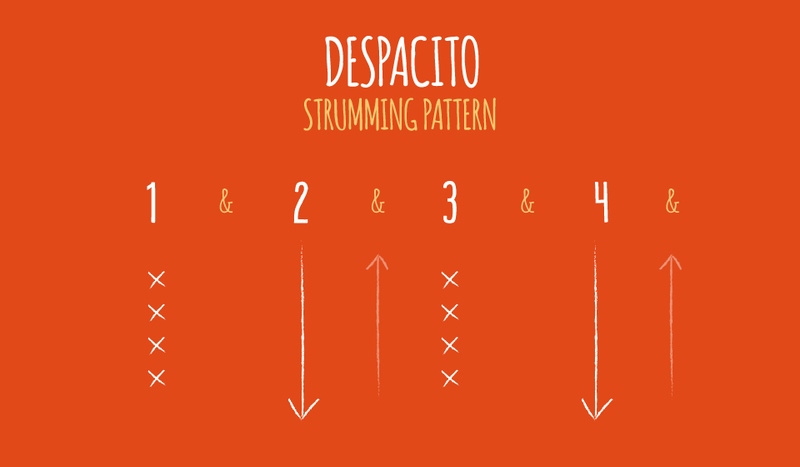 You have a few options when it comes to the strumming pattern for Despacito. The one I like to play is a slight variation on a simple D DU D DU pattern. To emphasise the off the beat feel, I like to play a chunk/muted strum for the first and third beats. To do this you just need to strum as you normally would but release the pressure from your fretting hand as you strum. You can play any number of slight variations of this – as long as you keep that off the beat feel then it’s all going to work pretty well. 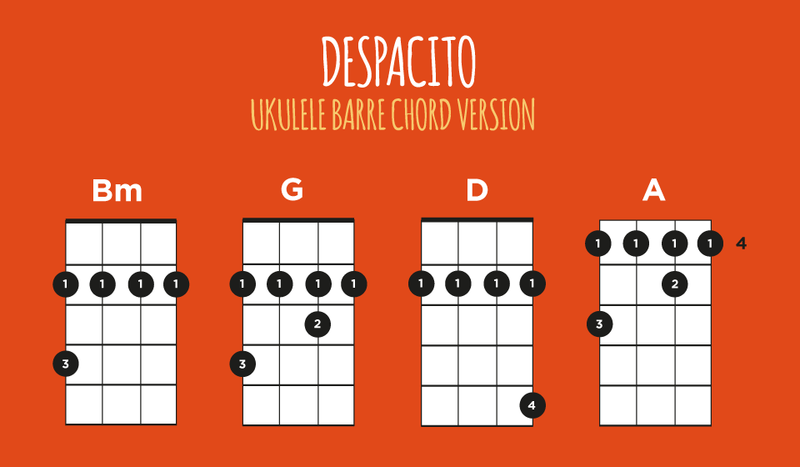 You’ll be playing the strumming pattern above twice for every chord change throughout Despacito. You’ll be pleased to know that the structure is really simple. It’s simply B minor, G, D, A throughout. All Barre Chords? Are You Mad? For those of you that like to punish yourselves, I’d recommend trying this one using all barre chords. It works really well and it just gives you a little bit more flexibility when it comes to muting the chords a bit. It’s the way I played it on the recording sample on this page. 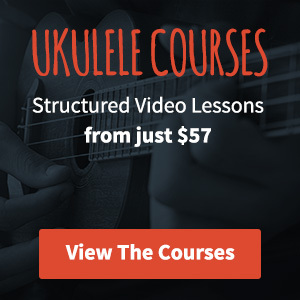 It also gives you the added advantage of learning a few chords in other positions which can’t be a bad thing.